Control software is the operational core of a broadcast facility. As such, it must be robust, stable, long-lasting, and flexible - exactly like the CTG-1000 Real Time Controller. Seamlessly integrating all major manufacturers' hardware, the CTG-1000 System is a prime reason for the on-air success rate and operational excellence of major broadcast facilities world-wide. The CTG-1000 is globally recognized for its reliability, flexibility, and longevity, and is relied upon for applications such as Olympics broadcasts and space shuttle monitoring. At the foundation of the CTG-1000 is a disciplined modular design. Rather than developing complex, intricately interconnected code which becomes increasingly fragile, Cyradis simplifies and encapsulates. Code for specific functionality and operation is isolated within individual software modules - some contain the software for standard operation, others provide hardware support, customer-specific functionality, and optional features. The end result is a clean, robust core product that is straightforward to develop, quickly customized, easily modified or ehnanced, and operates problem-free over the long term. Custom applications are then created by combining standard and optional CTG-1000 modules as required to meet customer-specific needs. This simple building-block approach allows us to "take the pain out of custom software": a custom application developed on budget and on time; a custom application built on software being used in the field world-wide and has been doing so uninterrupted for years. Cyradis customers also discovered how quickly and easily their CTG-1000 System can be enhanced or expanded. Because of its modularity and building-block development, the CTG-1000 is not susceptible to the introduction of errors during changes or enhancements. The process of making future changes simply consists of integrating one or more additional modules, which is done without negatively impacting existing system functionality. 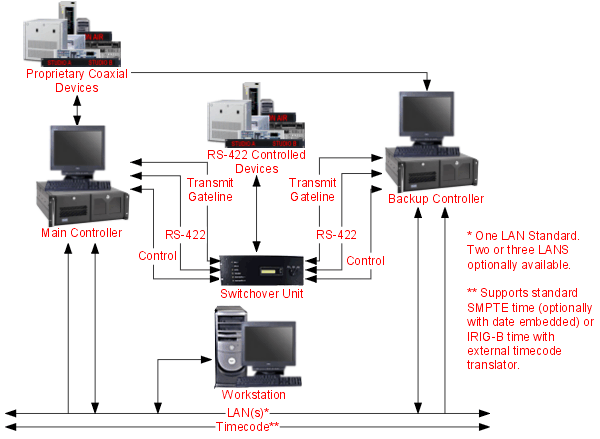 Some of the control solutions Cyradis has developed over the years with the CTG-1000 System include applications such as System-Wide Routing Control (CTG-10000 SWR), Video Management Control (CTG-1000 VMS), Router Web Gateway (CTG-1000 RWG), Proxy FTP Engine (CTG-1000 FTP), supervisory monitoring (CTG-1000 SMN), multi-channel broadcasting (CTG-1000 MBS), under monitor display and source ID control (CTG-1000 UMD), split production control (CTG-1000 SPS), and virtual control panels (CTG-1000 VCP). The typical hardware configuration for the system consists of two rack-mounted industrial grade computers, a switchover unit, and an IBM or compatible PC - all operating over a Local Area Network. The two computers are the main and backup controllers, each of which is equipped with identical hardware for timecode, LAN support, peripheral device communications, etc. A seamless hot control transfer is provided by the switchover unit whenever the main controller goes off line. The unit also allows manual switchover so that control can be delegated to one controller while the other is intentionally brought offline. Continuous updating of both controllers with system activity ensures that no data is lost when switchovers occur. The PC serves as the system workstation, which is used for day to day operation. Installed on both controllers is the CTG-1000 program, which is a custom software package operating under QNX. This software is quickly and easily tailored to meet the hardware support and functionality requirements of individual customers. Installed on the Workstation is an intuitive, easy to use GUI, which is platform independent and can therefore operate under Windows, Linux, UNIX, or QNX.